*This post contains affiliate links. If you click or purchase from these links I will make a commission. Thank you for supporting Truly Yours, A.! I don't know about you guys, but I'm already dreaming about summer. I plan on hitting the beach as much as I possibly can before fall rears it's big, dreary head. Before I can do that I'll need to get in tip-top shape! I don't want to lose a ton of weight, but I want to feel confident and comfortable in whatever swimsuit I decide to buy. I've been skipping out on my yoga workouts, but I decided to get earlier each day just to squeeze them in my day. I do my workouts at home, but that doesn't mean that I can't throw on a cute outfit and sweat it out. I actually think a new workout wardrobe might be just the thing to get me back in the swing of things. 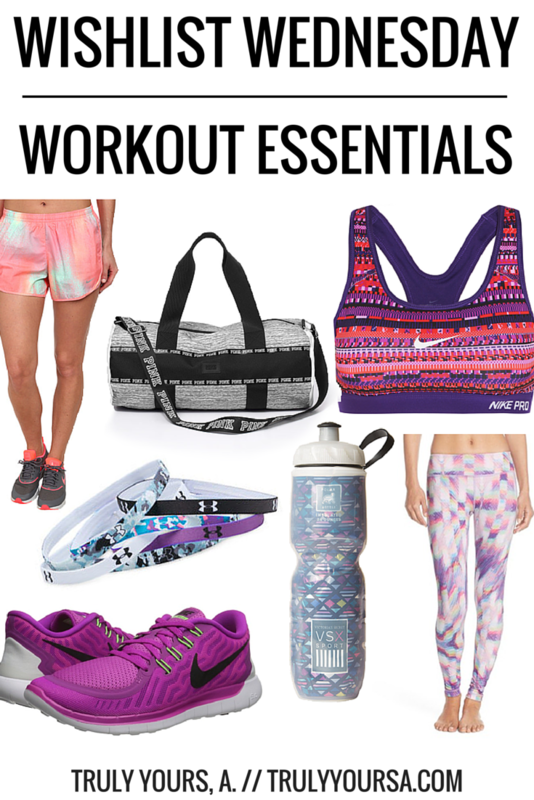 Keep reading to check out my wishlist of my current workout wants! Nike Pro Classic Dri-FIT Sports Bra // Sports bras are one of the most important pieces of workout gear you'll ever own. My favorite sports bras are from Nike hands down. They offer so many different coverage and impact options that it would be almost impossible to find one that works for you. The Nike Pro Classic Sports Bra is perfect for running or yoga and comes in a multitude of colors. The pads keep your girls from looking too flat and the Dri-Fit technology wicks away sweat. I'm hoping to stock up on a few of their brighter options this spring. Nike Roshe Run + Nike Free 5.0 Running Shoes // It should also come as no surprise that my favorite workout shoes are also from Nike. These two pairs of shoes are the most comfortable shoes for HIIT or your next Zumba class. Both are made from super breathable materials and have color options that only match up with other Nike gear. I love them both so much that I plan on investing in a pair for work and another just for working out! Zella Leggings // I don't own any Zella leggings, but I've read from other bloggers that they are amazing for working out in winter or summer. They come in regular and crop lengths and have some of the coolest colors and patterns. I would love to invest in a couple pairs for when I don't feel like wearing shorts all the time. Nike Tempo Running Shorts // I promise this post isn't sponsored by Nike (but that would be nice! ); I just really love their products. These shorts are beyond amazing and I live in them in the summer even when I'm not working out. They have great breathability and some pairs even have a pocket in the back for keys or phones! I love the variety of color options, but I'm currently obsessed with this reflective pair. 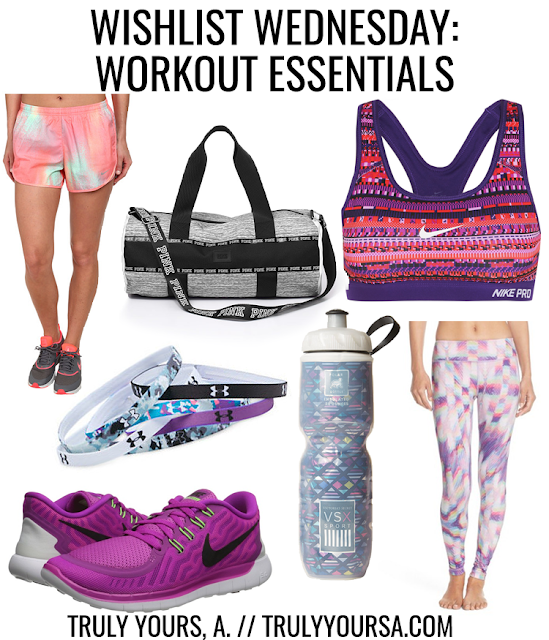 Victoria's Secret Sport Water Bottle + Gym Bag // A workout essentials list isn't complete without a pretty water bottle and even prettier gym bag. This insulated water bottle from Victoria's Secret keeps your water cold for your entire workout and matches perfect with this PINK gym duffle. It's not the biggest bag in the world, but it will definitely fit all your gym necessities. I'm also loving Forever 21 and Old Navy's active lines. Everything is really affordable and there's quite a few cute pieces that I plan on adding to my workout wardrobe. Where's your favorite place to shop for activewear? Let me know in the comments below!